2 Magnets - How Do They Work? 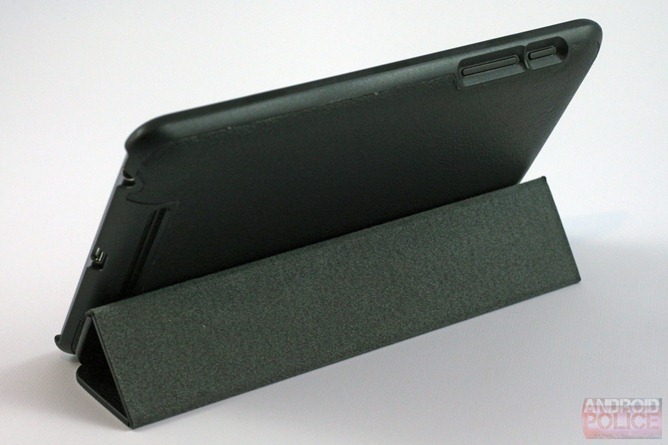 For the most part, I'm satisfied: $20 gets you a case that's roughly the same size as the one from Asus, with full protection, a foldable stand, and inlaid magnets for the Nexus 7's sleep function and clasp. It's far from perfect - Poetic isn't exactly a household name, after all - but if you're looking for more features than the first-party case, it's certainly worth investigating. 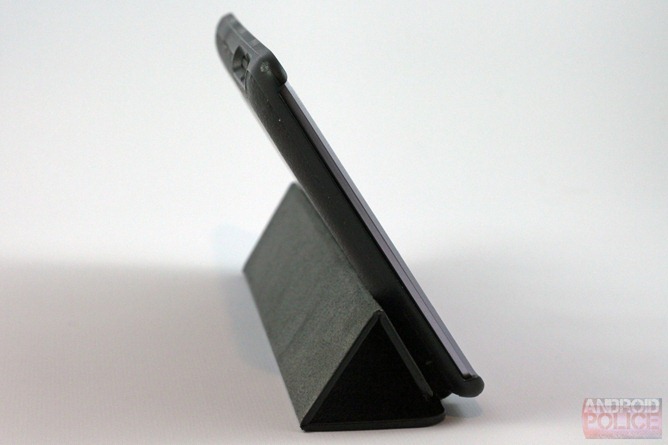 The Poetic case has a pretty simple design: a full, hard plastic body with a segmented cover that folds back into an upright stand which can also be laid flat for a more horizontal view. 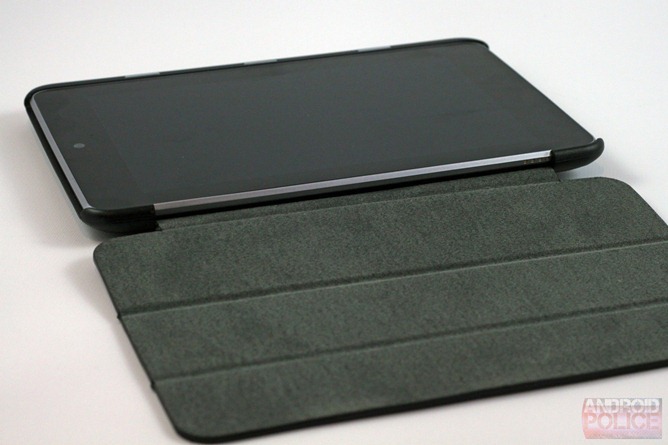 Say what you will about Apple, but the Smart Cover introduced with the iPad 2 is ingenious and often copied, and the basic principle is applied in this case as well. Cutouts for the power and volume buttons and the rear speaker line up well, as do grooves for the headphone and USB ports. Unfortunately there's no way to access the pogo pins when the case is closed. Magnets inside the cover wake the tablet when you open it and put it to sleep when you close it, and extra magnets on the right lip hold it closed. 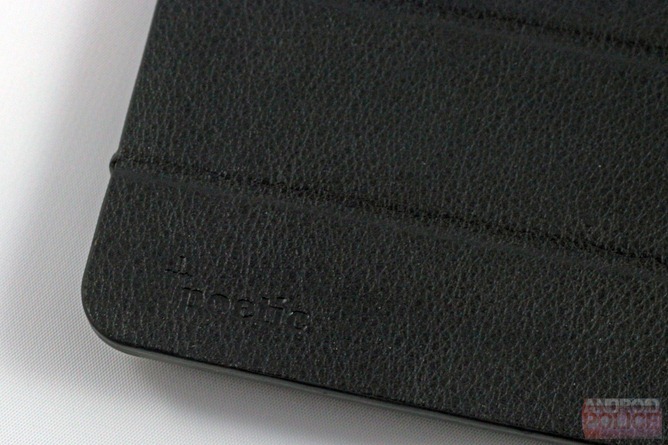 Inside both the body and the cover is a light felt material that won't scratch the screen or the back. 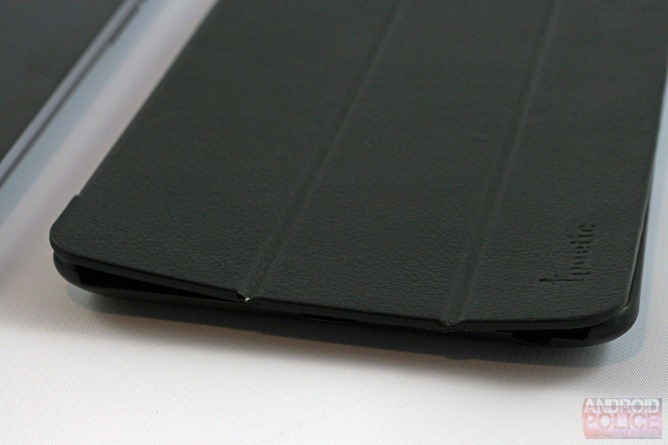 The outside is covered with a slightly flexible, leather-textured plastic. It won't fool anyone, but it looks a little better than it otherwise might. 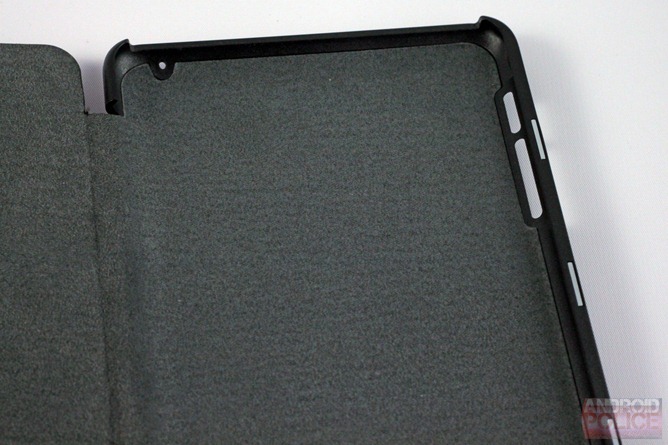 Extra padding on top and bottom give more protection to the corners of the tablet. The only adornment is an inlaid "Poetic" logo on the corner of the top, which is surprisingly unobtrusive. For twenty bones, I wasn't expecting a lot, but I was pleasantly surprised. After a couple of weeks of constant use (and mild abuse), the case has held up quite well. A four-foot drop onto concrete resulted in only a slight dent in the corner. The whole thing only adds a little over a quarter-inch in bulk, though the weight difference is a little more noticeable. There are a set of very weak magnets embedded into the first third of the cover, aligned with the magnetic sensor in the screen which we reported in July. It works just like you'd expect it to. 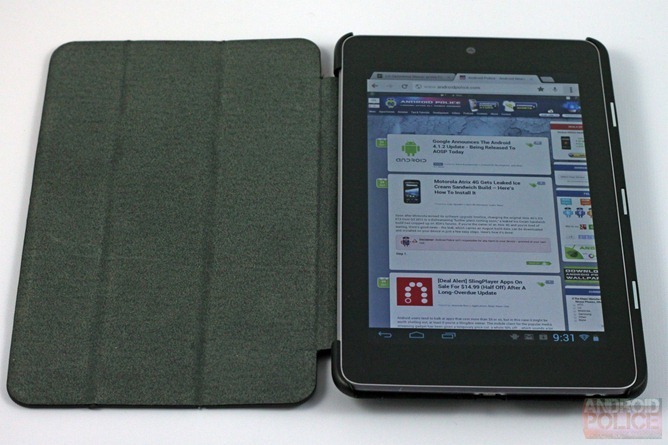 Open the cover and the tablet wakes, close it and the tablet turns off its screen and goes to sleep. 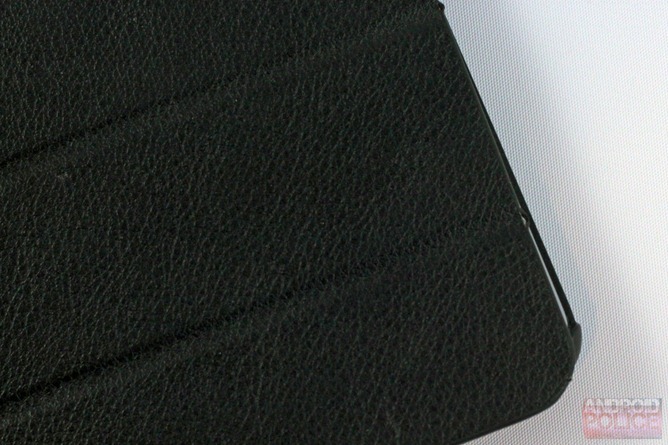 It makes operation with the case a lot quicker, and after using it for a few weeks I don't think I could go back to using a book-style case without the feature. 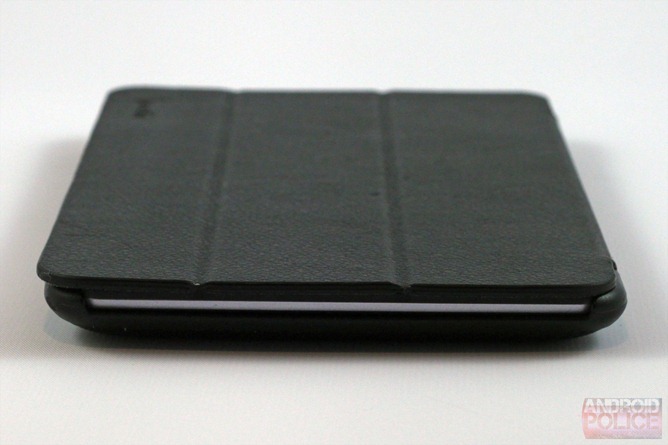 Credit where it's due: the Smart Cover design is a great way to use a tablet. 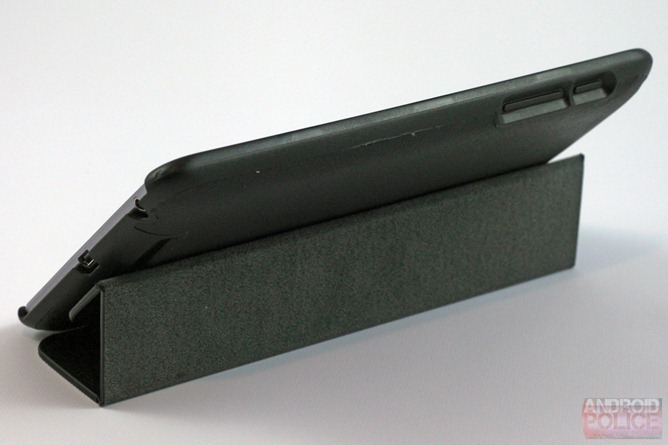 There are also three magnets on the right side of the case body, exposed to the user on a slightly thicker area that runs along the lip. These magnets hold the cover in place when it's closed. 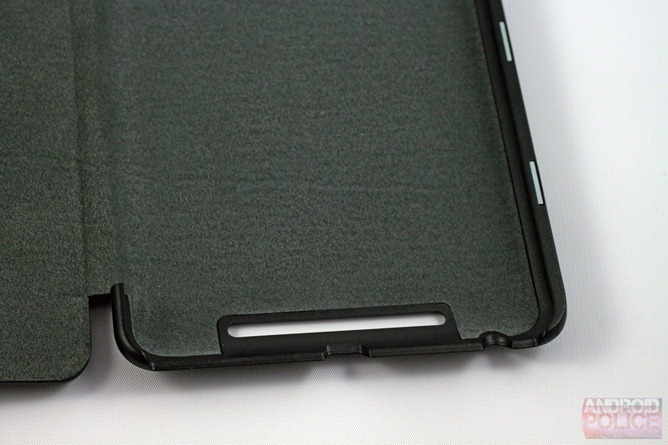 It works well enough, though as stated previously, the lack of a physical clasp means the cover can slide around a bit on top of the screen. That said, when the case is closed, there's pretty much no way to accidentally open it. There's a satisfying amount of pressure required to lift it away from the magnetic pull. 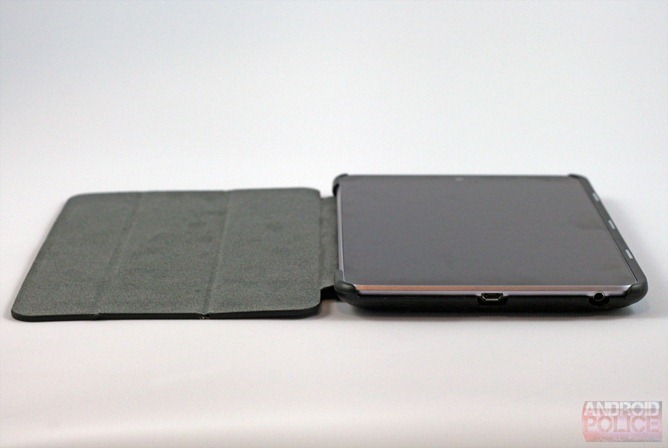 I did notice one flaw with the case: when holding it with the cover folded back, magazine-style, sometimes the magnets on the left side will inadvertently activate the smart cover in the screen, right through the bottom of the tablet. 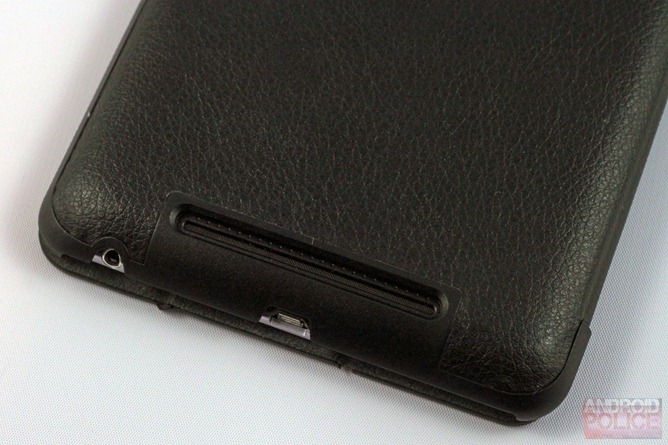 This will cause it to think that the cover is closed, shutting the screen off while you use it. This doesn't happen often - perhaps one out of every thirty times I fold the cover back - and hasn't discouraged me from using the Poetic case. My primary motivation for choosing the Poetic Slimline over other models was the stand function. 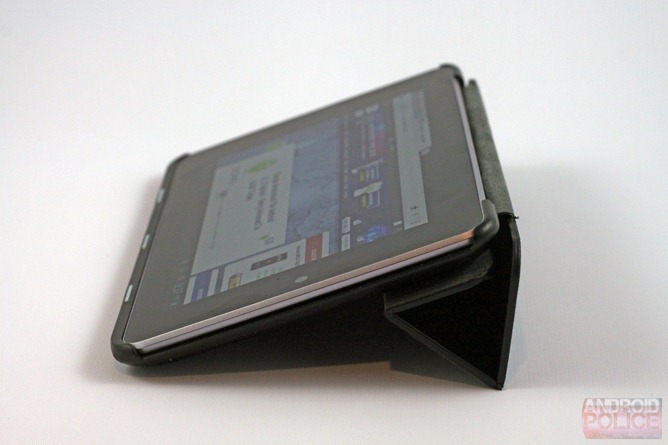 Fold the cover back in thirds and it becomes a basic stand, adding two hands-free modes of operation. 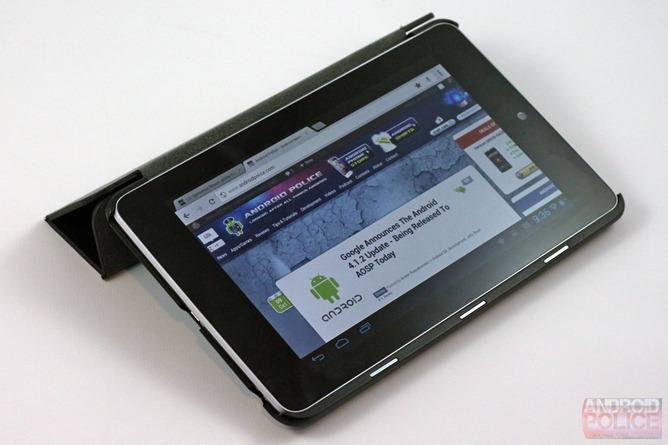 The most obvious is an upright position, putting the tablet at a roughly 75 degree angle to a flat surface. 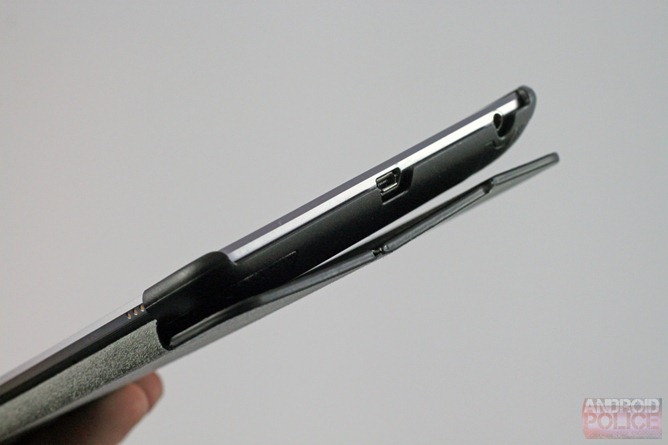 You can also lay it down in what I think of as the "typing" position, useful if you want to prop up your Nexus for easy manipulation at a 30 degree angle. Playing with the cover can get you a few different positions, though I'm not sure they were intended by the manufacturer. 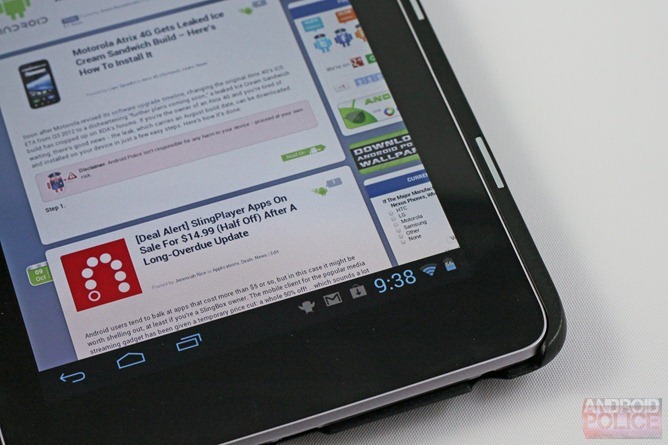 When in the upright position it's perfect for watching videos, but anything more than light taps can make it slide back into a more "relaxed" angle as the cover gives to the pressure. 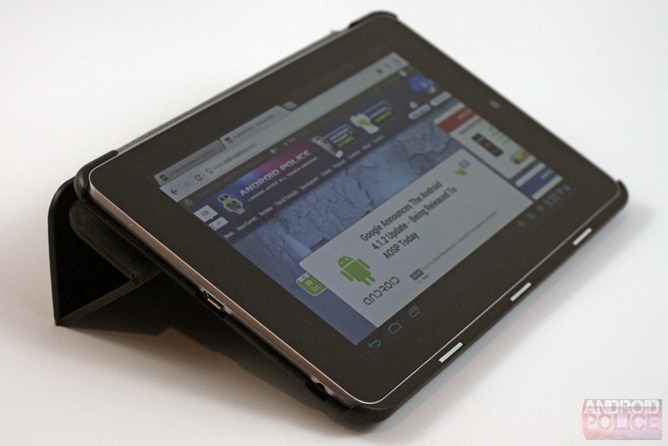 It's much more stable in the "down" position, much easier for extended use with a lot of typing and scrolling. Both positions have their advantages. I tend to leave it upright when I'm watching Netflix or just flicking through Twitter or Gmail, and I put it down when I'm doing more serious work. 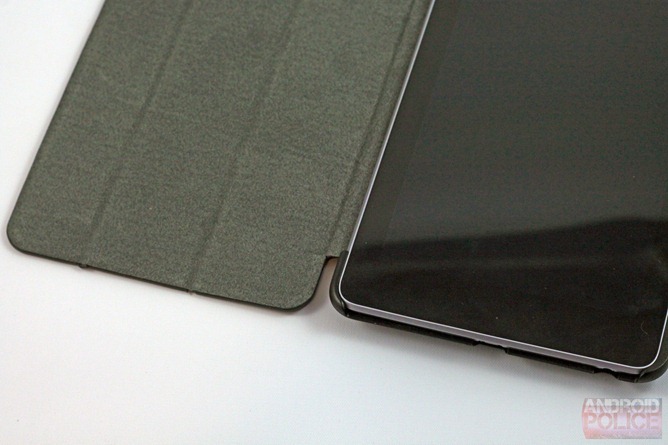 Folding the cover back makes the tablet noticeably thicker in your hand, and while in the case it's much harder to fit into a separate stand (for portrait viewing, perhaps). 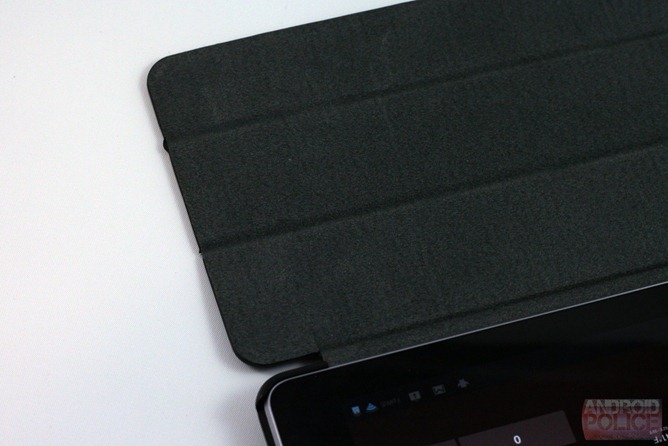 But the same can be said for just about every full tablet cover, and unlike those made for more conventional 10-inch tablets, the Poetic model won't obscure access to any buttons or ports except the pogo pins. I'm quite happy with my purchase of the Poetic Slimline. It does everything it advertises, without fuss or flash. 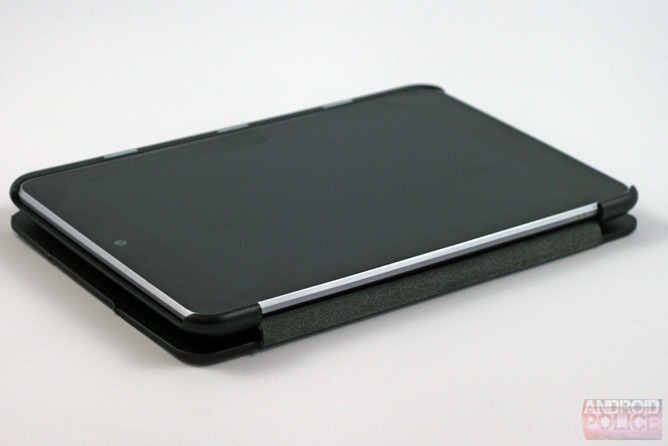 The understated and frankly cheap build won't turn any heads, but it should keep your Nexus 7 safe with the added benefits of magnetic sleep and wake, as well as two different horizontal stand positions. I've got concerns about the long-term wear and tear, but at only twenty dollars, I wouldn't regret the investment even without the included three-year warranty. 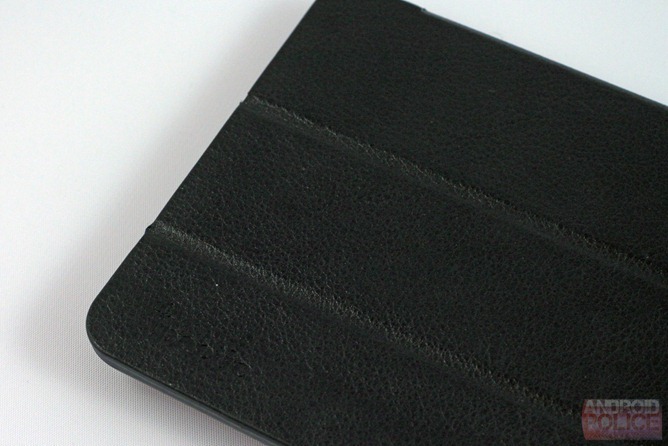 The Poetic Slimline Portfolio Case is available on Poetic's website for $39.95, but I recommend grabbing it through Amazon, where it's just $19.95 before shipping.